Hookworms, infecting over one billion people, are the mostly closely related major human parasites to the model nematode Caenorhabditis elegans. Applying genomics techniques to these species, we analyzed 3,840 and 3,149 genes from Ancylostoma caninum and A. ceylanicum. Transcripts originated from libraries representing infective L3 larva, stimulated L3, arrested L3, and adults. Most genes are represented in single stages including abundant transcripts like hsp-20 in infective L3 and vit-3 in adults. Over 80% of the genes have homologs in C. elegans, and nearly 30% of these were with observable RNA interference phenotypes. Homologies were identified to nematode-specific and clade V specific gene families. To study the evolution of hookworm genes, 574 A. caninum / A. ceylanicum orthologs were identified, all of which were found to be under purifying selection with distribution ratios of nonsynonymous to synonymous amino acid substitutions similar to that reported for C. elegans / C. briggsae orthologs. The phylogenetic distance between A. caninum and A. ceylanicum is almost identical to that for C. elegans / C. briggsae. The genes discovered should substantially accelerate research toward better understanding of the parasites' basic biology as well as new therapies including vaccines and novel anthelmintics. Comparative sequence analysis is an approach proven to aid in recognition of genes and defining of their function, especially when comparing genomes of close evolutionary distance. In addition, when partial genomes are placed in a context of a well-studied and fully sequenced model organism they can greatly facilitate the understanding of the less studied organisms' biology. Adult (Ad) hookworms inhabit the small intestine and produce eggs that pass in the feces and hatch in the soil. The first stage larva (L1) feeds on bacteria and molts twice to form the non-feeding, infective third stage (iL3). iL3 enters the host by penetrating the skin, or orally in the case of Ancylostoma species, molts twice, and matures to Ad in the small intestine. A. duodenale and A. caninum L3s can also infect a host, temporarily abort maturation and enter an arrested state (hypobiosis) within the host's somatic tissues , reactivating in response to host physiological changes such as pregnancy . Current hookworm control strategies are limited to de-worming of infected people using anthelmintic drugs. However, rapid re-infection in endemic areas and the lack of sterile immunity necessitates repeated treatments and can in turn result in resistance. Additionally, tissue-arrested stages are relatively resilient to the effects of anthelmintics . The Human Hookworm Vaccine Initiative is beginning clinical trials of a larval hookworm antigen, ASP-2, from N. americanus, as a vaccine antigen . There is a critical need for further research to identify new vaccine and drug targets as well as to better understand hookworm biology. Lack of sequence information has been a major hindrance to hookworm molecular studies. High throughput sequencing of expressed sequence tags (ESTs; sequences derived from randomly selected cDNA clones) has proven a cost-effective tool for discovering genes . Because the hookworm superfamily (Ancylostomatoidea) falls within nematode Clade V [8, 9], which also contains the well-studied model nematode Caenorhabditis elegans , predictions may be made and tested based on their close relatedness. Previous genome-based characterization of hookworms has been limited to sampling of few hundred ESTs  and molecular studies of individual genes of interest (eg. ; reviewed in ). EST approaches have also been initiated for other Strongylid parasites including Haemonchus contortus [14, 15] and Nippostrongylus brasiliensis . In this report we describe the comparative analyses of almost 20,000 ESTs from 7 different cDNA libraries representing pre-parasitic and parasitic larval through adult stages of the hookworms A. caninum and A. ceylanicum. The dataset defined nearly 7,000 hookworm genes, including a number of putative developmentally expressed genes and candidates for further study as drug target or vaccine components. Nearly 20,000 Ancylostoma derived ESTs were submitted to GenBank between 1999 and 2003 [see Additional file 1]. For simplicity, the results and analysis described are presented in the same order beginning with A. caninum and followed by A. ceylanicum, except where specified. ESTs originated from 7 cDNA libraries, representing three and two life-cycle stages respectively (Table 1). Clustering, implemented to reduce data redundancy and improve sequence quality and length, grouped ESTs into contigs which were further organized into clusters (Table 1), providing a non-redundant catalog of represented genes. ESTs within a contig derive from nearly identical transcripts while contigs within a cluster may arise from splice isoforms, alleles, or closely related paralogs . Fifty-one potentially chimeric ESTs were discarded. Clusters ranged in size from a single EST to 203 and 323 for A. caninum and A. ceylanicum respectively (Figure 1). Most clusters for each species (72% and 55%) have ten or fewer ESTs. GC content for coding sequences was similar in the two species (44% and 48%) and consistent with other Clade V nematodes like C. elegans and C. briggsae . Ancylostoma NemaGene v2.0 clustering showing the distribution of ESTs by cluster size. For example, there are three A. caninum cluster of size 22 containing a sum of 66 ESTs and there were eight A. ceylanicum clusters of size 22 containing a sum of 176 ESTs. Cluster size (x-axis) is shown to scale for 1–75 members, with the size of larger clusters indicated. The number of clusters may overestimate gene discovery, as one gene may be represented by multiple non-overlapping clusters (fragmentation). By using C. elegans as a reference genome (19,522 genes; ) and discounting for fragmentation calculated as 4.5% and 6.5 % respectively , the estimated gene numbers were reduced to 3,840 for A. caninum and 3,149 for A. ceylanicum giving a gene discovery rate of 41% (3,840 × 100/9,283) and 30% (3,149 × 100/10,588). These numbers also indicate 20% and 16% representation of all genes for each species respectively. The number of genes in common for more stage-specific Ancylostoma libraries analysed was as low as 9% and 11% (Figure 2). This may reflect the EST sample size or stage-specific expression, as will be discussed. In either case, the results clearly show the advantage gained for gene discovery in Ancylostoma by including diverse life stages in the analysis. Venn diagram of A. caninum (A) and A. ceylanicum (B) clusters, based on stage of origin of each cluster's EST members. The majority of clusters are represented by only one stage in this investigation, though greater depth of sampling would likely increase representation by multiple stages. Thirty-four percent of A. caninum and 54% of A. ceylanicum clusters align to InterPro domains and 21% and 36% map to Gene Ontology (GO) respectively. Following this same pattern, A. caninum also had fewer BLAST matches (see below). Seven of the ten most abundantly represented InterPro domains were common to both species (Table 2). GO representation is shown by biological process, cellular component, and molecular function (Table 3). Among the most common GO categories are protein metabolism (GO:0019538) and catalytic activity (GO:0003824). Within Ancylostoma spp. clusters that had extracellular mappings, 70% and 56% respectively were in the category of Allergen V5/Tpx-1 proteins (IPR001283) related to the secreted venom proteins from hymenopteran insects (Table 2). The Ancylostoma secreted proteins (ASPs) belong to this large gene family , members of which been shown to play roles in host-parasite interactions for both mammalian [20, 21] and plant parasitic nematodes , and to induce protective responses . ASP-1 is one of the major proteins secreted by serum-stimulated A. caninum iL3 . In addition, four A. ceylanicum clusters were classified in extracellular matrix (GO:0005578) as tissue inhibitor of metalloprotease (TIMP) domain proteins. A TIMP homolog is reported as the most abundant protein in adult hookworm excretory/secretory products and may inhibit host metalloproteases . Ten % and 15% unique clusters for A. caninum and A. ceylanicum respectively, mapped to 89 metabolic pathways grouped in 11 categories (Table 4). Complete listings and graphical representations of the KEGG mappings are available at http://www.nematode.net. Pathways well represented by both species include glycolysis/gluconeogenesis, citrate cycle, oxidative phosphorylation and fatty acid biosynthesis and metabolism. KEGG analysis (Table 4) also suggests specific biochemical differences among Ancylostoma stages. For example, while serum stimulated L3-specific clusters make up to 27% of all AC clusters, they account for 40% of all KEGG pathway mappings. In contrast, iL3-specific clusters that account for 55% of all AC clusters make-up only 38% of KEGG pathway mappings. It is unclear whether the predominance of enzyme mappings from the ssL3 stage versus iL3 stage is indicative of greater metabolic activity, greater metabolic complexity, differences in library construction methods, or other differences. Within A. ceylanicum clusters, 83% had homology to proteins from other organisms as compared to only 66% for A. caninum (Figure 3). To investigate why contigs from closely related species would show a difference in identified homologies, we compared sequence lengths and the open reading frame (ORF) lengths of contigs with and without homologies in both species. EST lengths and contig lengths, respectively, were shorter for A. caninum (410 and 549 nucleotides) than for A. ceylanicum (490 and 637 nucleotides). The differences were even more striking for ORFs (Figure 4). 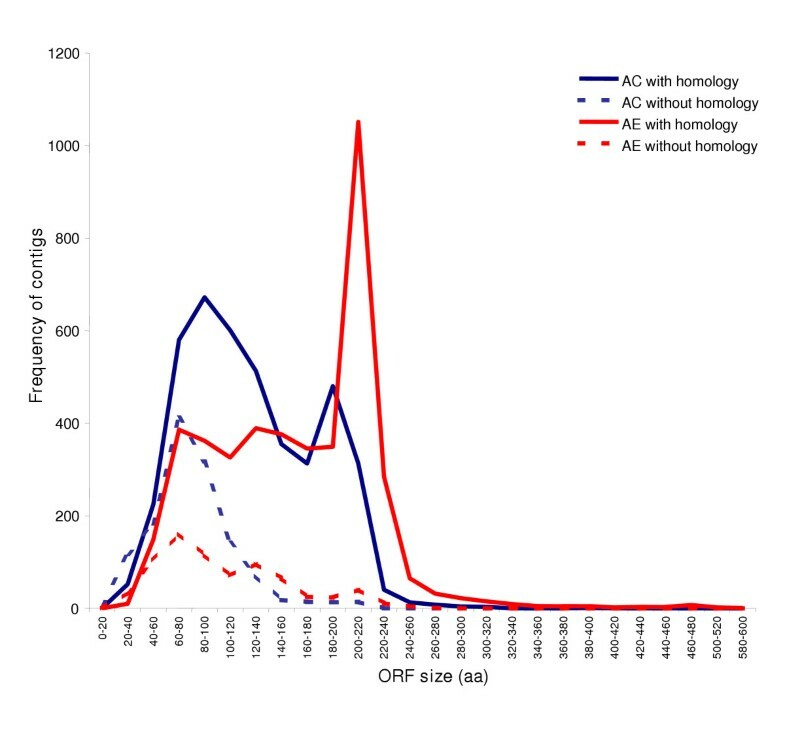 Hence, A. caninum contigs very likely identify fewer homologs because these sequences are shorter, contain smaller ORFs, and probably include more 3' UTR versus the superior quality dataset from A. ceylanicum. Most likely, differences in library construction and sampling rather than intrinsic differences between the species explain this discrepancy. Accounting for such differences is important as it keeps analysis focused upon interesting features of the dataset related to the organisms' biology rather than artifactual differences arising from data collection. Venn diagram showing distribution of A. caninum (A) and A. ceylanicum (B) cluster BLAST matches by database. 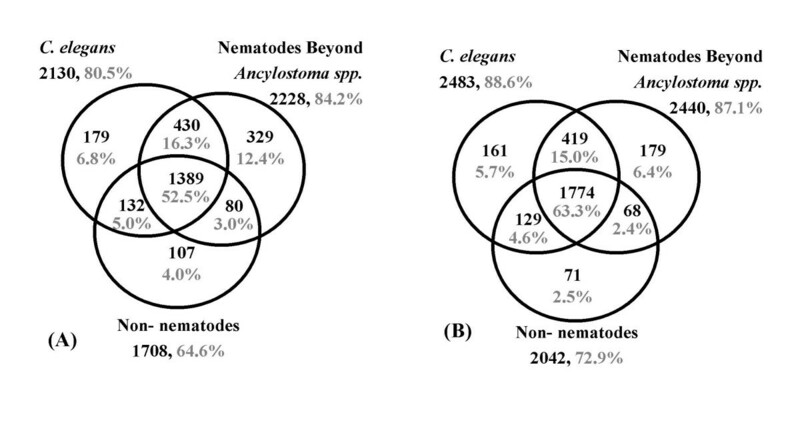 Amino acid level homologies (≥ e-05) were identified to non-Ancylostoma sequences for 65.8% (2,646/4,020) of A. caninum and 83.1% (2,801/3,369) of A. ceylanicum clusters. Databases used are: for C. elegans, Wormpep v.97 and mitochondrial protein sequences; for other nematodes, all GenBank nucleotide data for nematodes except C. elegans and Ancylostoma; for non-nematodes, nrGenBank (3/20/2003) with all nematode sequences removed. Distribution of A. caninum and A. ceylanicum contigs with and without database amino acid level homology by size of the longest predicted open reading frame (ORF). The distribution of identified homologs (Figure 3) was consistent with earlier observations . Besides C. elegans, one of the more informative nematode datasets for this study is a collection of 4,780 ESTs from the human hookworm Necator americanus to which homologies were commonly found (42% and 38% respectively). 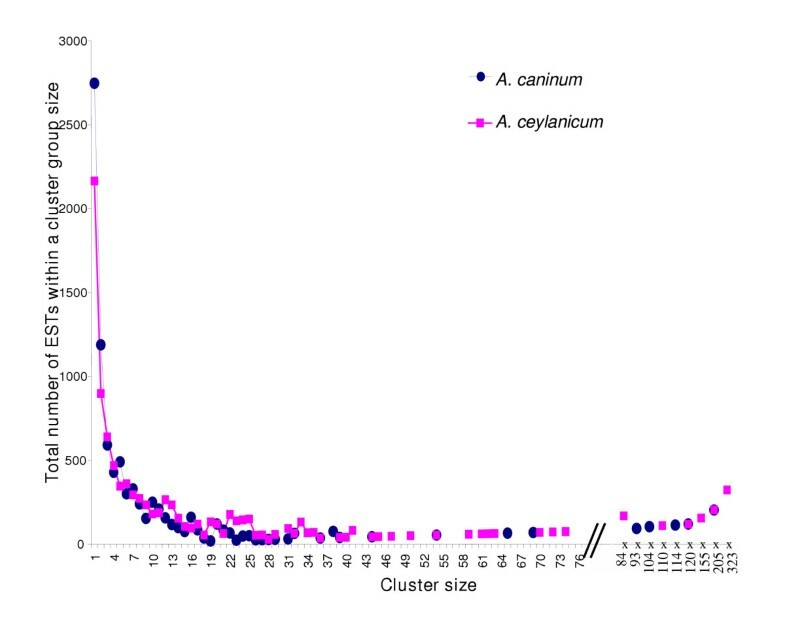 Within Ancylostoma itself homologies were common with 34% of total A. caninum clusters matching the A. ceylanicum dataset and 44% of total A. ceylanicum clusters matching A. caninum. Searching for putative orthologs between all A. caninum and A. ceylanicum contigs resulted in 1,304 reciprocal best TBLASTX hits. The ortholog pair members were very similar in GC composition (46% and 47%) and the average length of alignment was 327 bp. 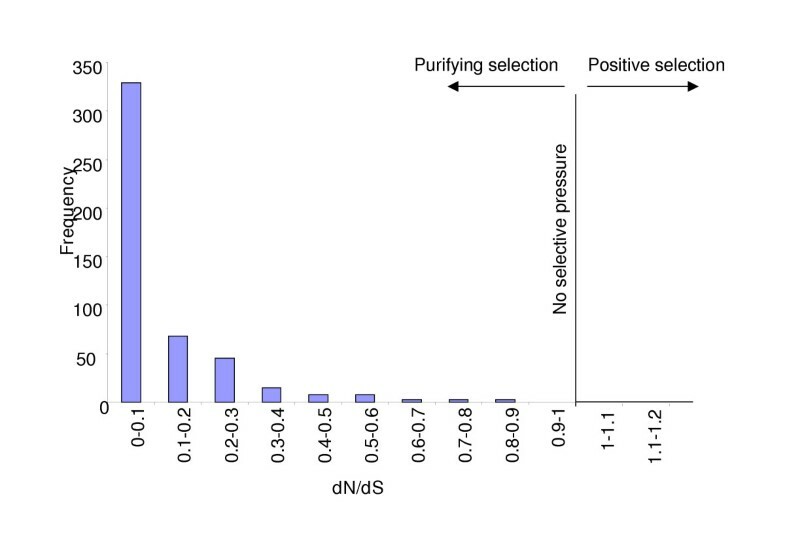 All ortholog pairs (574) were under purifying selection (dN/dS < 1; Figure 5) and the average dS was 0.65 ± 0.83 and dN was 0.11 ± 0.2. The average dN/dS ratio (~0.17) is higher than that reported for C. briggsae/C. elegans (~0.06; ), and closer to that for mouse/human (0.115; ), indicating that the levels of purifying selection are somewhat different. In addition, to examine if this purifying selection is more frequently detected in genes with essential function, we cross-referenced the C. elegans genes matched by Ancylostoma orthologs with a list of C. elegans genes with available RNA interference (RNAi) information (http://www.wormbase.org; eg. ). Of the 67% of the orthologous genes matching C. elegans genes with available RNAi data, 45% had an observable phenotype after transcript knock-down. A vast majority of the observed phenotypes were severe (88% sterility and embryonic lethality). Ancylostoma orthologs matching C. elegans genes that had phenotypes showed a somewhat lower dN/dS ratio than those matching genes that remained wild type after RNAi treatment, though the difference was not statistically significant at P < 0.05 (0.09 vs. 0.14; sign. diff. at P < 0.2). Distribution of dN/dS ratios among Ancylostoma ortholog pairs. dN and dS are the rates of nonsynonymous and synonymous amino acid substitutions, respectively. In a 4-way comparison of orthologs in C. elegans, C. briggsae, A. caninum, and A. ceylanicum, the phylogenetic distance between A. caninum and A. ceylanicum is almost identical to that between C. elegans and C. briggsae and the distance between the two genera is just over four times the within genera distance (Figure 6). Average branch lengths for the set of 452 orthologous proteins did not show a significant difference in relative rate of molecular change. Maximum likelihood trees  were constructed for each 4-way ortholog and relative branch lengths compared between Ancylostoma spp. for both the protein and nucleotide sequences. For protein sequences, 109 trees had equal branch lengths for the hookworm species while 175 trees had longer A. caninum branches and 168 had longer A. ceylanicum branches. To look for differences between genes in the Ancylostoma species, we constructed a distribution of branch length differences between each of the sister species pairs in our tree. Because some genes may be rapidly evolving in all nematode lineages we evaluated a subset of the trees where the difference in branch lengths between C. briggsae and C. elegans were less than one standard deviation from the mean but which had significantly different branch lengths in the two Ancylostoma species. This final dataset had 23 genes with significantly longer branch lengths in A. ceylanicum and 16 in A. caninum (1 SD, P < 0.05). However the set did not show any significant bias towards either species (p < 0.34, sign test). This suggests there is no significant rate difference in protein evolution between the two hookworms, although some of these genes are relatively rapidly evolving. Repeating the analysis for nucleotide sequences we find marginally significant differences (p < 0.08; sign test). Relative distance based upon protein maximum likelihood. A. ceylanicum to A. cananum distance is similar to C. elegans to C. briggsae distance. Ancylostoma to Caenorhabditis distance for any species is 4.3X the Ancylostoma to Ancylostoma distance and 4.1X the Caenorhabditis to Caenorhabditis distance. The length of each line segment is proportional to the calculated branch length between the species. As expected, the C. elegans genome provides the best source of information for interpreting hookworm sequences as a majority of A. caninum and A. ceylanicum clusters with BLAST homologies outside Ancylostoma had C. elegans homologs (Figure 3; 25 most conserved nematode genes between each Ancylostoma species and C. elegans are available online; [see Additional file 2]). Furthermore, C. elegans orthologs of hookworm genes with available RNAi or other data provide information that may be relevant to understanding the role of the parasite genes. Of all the Ancylostoma clusters with C. elegans homology, 97% and 92% matched C. elegans genes with available RNA interference knock-down information http://www.wormbase.org, and in turn 33% and 37% of these C. elegans genes produce RNAi phenotypes (versus a rate of only ~15% phenotypes for all C. elegans genes). Phenotype classification [see Additional file 3] showed that C. elegans genes with expressed Ancylostoma homologs were somewhat more likely to have severe phenotypes . Hence, certain genes in the Ancylostoma datasets encode proteins if disabled may disrupt survival of the parasite. Some examples include abundant clusters (AC00023.cl, AE01104.cl; Table 5 and Table 6). A group of particular interest is proteins that are required for nematode survival and lack strong homologies outside of the phyla (nematode-specific), since these targets could provide for nematode control without toxicities to the host or other non-target organisms. 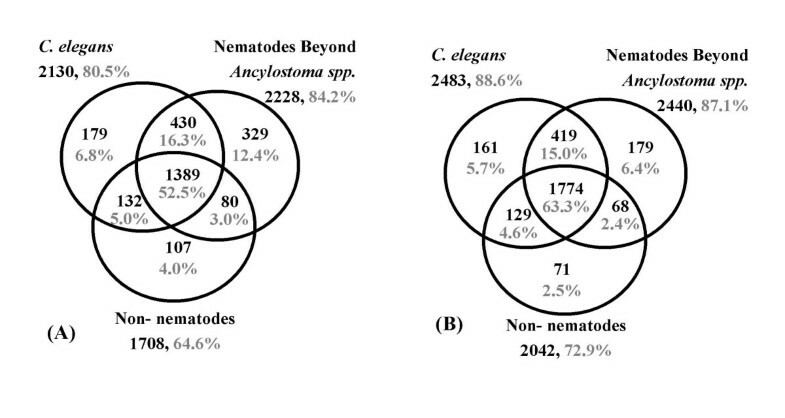 Of the Ancylostoma nematode-specific clusters (Figure 3), 85 and 91 respectively had C. elegans matches with RNAi phenotypes. Among these, AC04398.cl and AE00474.cl matched hypothetical protein F42A8.1 (1e-65, 2e-76 respectively), a gene without a mammalian homolog yet likely involved in multiple developmental processes based on observed mutant phenotypes . Homologs are found in at least 13 nematode species to date including free-living species (3), and parasites of mammals (8) and plants (1). Further analysis will identify additional genes which warrant detailed investigation. a SW/TR is Swiss-prot and TrEMBL Proteinknowledgebase http://us.expasy.org/sprot/. b C. elegans homolog has higher probability match than the best GenBank descriptor. Repeating the analysis in Stein et al. indicates that 6–7% of C. elegans and C. briggsae proteins are candidate "orphans", lacking homologs outside of the species. We examined whether these genes are truly orphans that have arisen in a Caenorhabditis sub-lineage or are instead genes present in an ancestral nematode that have been lost or evolved beyond recognition in one species. Of candidate orphan proteins, ten from C. elegans (Table 7) and 27 from C. briggsae [see Additional file 4] match A. caninum and/or A. ceylanicum clusters, with three and eight, respectively, having matches in both species. Most of the C. elegans orphans are hypothetical proteins of unknown function though some had functional information from InterPro domains (R10E9.3) or mutant phenotypes (ZK686.1). Therefore, at least a portion of the genes identified in either C. elegans or C. briggsae as "orphans" are actually ancestral nematode genes with homologs found in other clade V species and further clade V sequencing will likely reveal more such cases. The 25 most abundantly represented clusters account for 14% and 19% of ESTs for A. caninum and A. ceylanicum respectively. The representation of the abundant transcripts varied from shared to stage-specific (Table 5 and Table 6). Hookworm developmental stages differ in habitat, morphology and behavior, hence highly represented gene transcripts may identify functions that are important to the parasites at various stages. Differences in gene expression between A. ceylanicum stages have been demonstrated previously for several genes [27, 28]. Our comparison of iL3 and adult suggests additional examples (see Discussion). In fact, only 9% of the A. ceylanicum clusters are shared between iL3 and adult (Figure 2) and of the 25 largest clusters, 23 were biased toward one of the developmental stages (Table 6). While representation in EST collections generally correlates with source expression level , artifacts can occur [30, 31]. Differences in expression are most likely to be accurate when comparing the most abundant transcripts in each stage. Therefore, while follow-up work is needed to confirm expression levels, examination of ESTs provides a list of candidates for various expression profiles. We have taken a genomics approach to the study of hookworm species, key parasites of humans and domestic animals that are related to the model nematode Caenorhabditis elegans. Nearly 20,000 ESTs from Ancylostoma caninum and A. ceylanicum identified approximately 7,000 genes including over 1,300 likely orthologs represented in both species. Close to 900 genes encode putative enzymes involved in 88 metabolic pathways. Over 3,100 genes contain recognizable protein domains many of which have been categorized in the Gene Ontology hierarchy. 4,600 genes have homologs in C. elegans including numerous nematode-specific genes and hundreds with observable RNAi phenotypes. ESTs originated from libraries representing infective L3 larva, stimulated L3, tissue arrested L3, and adults resulting in an improved rate of gene discovery and allowing the identification of transcripts abundant in various stages. Infective L3 (iL3) are developmentally-arrested, non-feeding pre-parasitic stages, which when triggered by the infection process and host-specific signals reactivate, molt and complete development. A similar stage in C. elegans is called the dauer larva. In Ancylostoma species host factors such as dog serum stimulate feeding and an activation response in serum stimulated L3 (ssL3)  that approximates the transition to parasitism in the host . 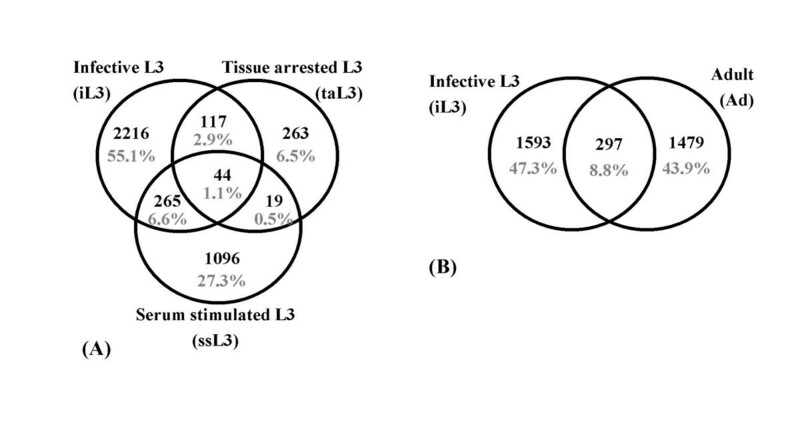 A. caninum tissue-arrested L3 (taL3) recovered from infected mice are a distinct population that potentially share properties with the arrested iL3. Developmentally arrested, non-feeding larvae would be expected to be dependent on stored energy reserves and lipid metabolic pathways; accordingly, the KEGG biochemical pathway mappings show a substantive number of clusters for fatty acid metabolism especially with the A. ceylanicum iL3 clusters (Table 4). C. elegans microarray experiments identified 540 dauer-enriched genes along with genes involved in dauer-recovery . C. elegans SAGE experiments identified 358 candidate dauer-specific genes . Genes shown to be abundantly expressed in C. elegans dauers include a variety of genes that may play roles in extended survival including heat shock protein encoding genes like hsp-12.6 and daf-21 (Hsp90), ctl-1 (cytosolic catalase), sod-3 (superoxide dismutase), and hil-1 and hil-3 (Histone H1's). A number of genes identified both in Ancylostoma L3s and C. elegans dauers are discussed below. hsp-12.6, a member of the hsp-20 family, was one of the most highly represented clusters in A. caninum iL3 and taL3 as well as A. ceylanicum iL3 (Table 5 and Table 6). Among a Strongyloides stercoralis EST collection, the gene is also found in iL3 but not L1 . C. elegans hsp-12.6 is upregulated in dauer and starved L1s [34, 36] and is a transcriptional target of the FOXO transcription factor DAF-16 . Unlike other HSPs, C. elegans hsp-12.6 is not stress-induced and does not prevent aggregation of unfolded proteins, suggesting a novel role. AE00033.cl, found exclusively in adult ESTs, encodes an ortholog of the Nippostrongylus brasiliensis HSP-20 protein. Nb-hsp-20 is more similar to the HSP-16 group of the HSP-20 family of small HSPs in C. elegans, is also expressed in the adult , and is not stress regulated, suggesting that it may function as an adult version of hsp-12.6. A. caninum iL3 showed abundant clusters encoding homologs of the mitochondrial cytochrome oxidase subunits I, II, III and a stress associated endoplasmic reticulum protein not seen in ssL3 (Table 5). One A. ceylanicum iL3 abundant cluster encoded a ribosome-associated membrane 4 protein (RAMP4) involved in ER protein translocation  which is over-expressed in hypoxia and suppresses degradation of ER membrane proteins . A homolog of C. elegans spp-4 was also expressed at high levels in A. ceylanicum iL3. spp-4 encodes an amoebapore, a member of the saposin-like protein superfamily that kill bacteria by forming membrane ion channels . Amoebapore proteins are one of a number of putative stress response proteins regulated by DAF-16 in C. elegans [37, 42]. These proteins, also including lysozyme and thaumatin, may provide a defense against worm pathogens and contribute to dauer longevity . Hookworm free-living stages are also soil dwelling microbiverous organisms exposed to soil pathogens, so it is possible that spp-4 plays an antibacterial role in A. ceylanicum. In contrast to iL3, A. caninum ssL3 showed a CMP-sialic acid transporter, cathepsin D-like aspartic protease, calponin-like protein, and ham-2 zinc finger protein among the abundant transcripts. While the significance of these molecules is unknown, upregulation of an aspartic protease during the transition to parasitism and tissue penetration/migration is consistent with its role in degradation of serum proteins and collagens . Abundant adult-specific clusters are likely to be involved in reproduction. For example, A. ceylanicum (Table 6) encodes an ortholog of the C. elegans VIT-3 protein, a lipid binding protein and major yolk component . VIT-3 is expressed exclusively in the C. elegans adult hermaphrodite intestine, secreted, and taken up by oocytes. Two clusters encode genes involved in metabolism of chitin, an important constituent of the nematode eggshell . One encodes a protein similar to C. elegans protein C34D4.11, and shows some similarity to a beet chitinase; the other encodes an ortholog of C. elegans B0280.5, a protein required for early embryonic development . B0280.5 mRNA is expressed specifically in the adult hermaphrodite germ line and is a target of GLD-1, an RNA binding protein required for oocyte meiotic cell cycle progression . While there are differences in the cluster profiles among Ancylostoma stages, there are shared transcripts as well. For example, the Ancylostoma secreted protein ASP-1 and ASP-like cDNAs are present in abundance in both A. caninum iL3 and ssL3. The secretion of ASP-1 protein by ssL3s was noted as a marker of the transition to parasitism . These results support conclusions made by Wang and Kim  that arrested larvae are transcriptionally prepared for dauer exit and upon receipt of appropriate stimulatory signals, exit from the arrested state is accompanied by a burst of translational activity in addition to further transcriptional activity. In contrast to ASP-1, ESTs for ASP-2 were exclusively detected in A. caninum iL3. Two of the most abundant A. ceylanicum transcripts encode fatty acid/retinol binding (FAR) proteins (Table 6). FAR proteins are novel fatty acid and retinol binding proteins described in nematodes including A. caninum, other Strongylida, filarial, and plant parasitic species [49–51]. In C. elegans 8 FAR members are divided into 3 groups. All the parasitic nematodes FARs described to date are most similar to the C. elegans A group containing Ce-far-1, -2, and -6. Seven A. ceylanicum clusters encode FAR proteins. Four of which (9 ESTs) were found in the adult cDNA library; clusters AE00748.cl and AE03203.cl were nearly identical to Ac-far-1 and Ac-far-2 (98% and 99% nucleotide identity) whereas cluster AE02490.cl showed the highest similarity to Ce-far-1 and AE01700.cl to Ac-far-2. The iL3 specific clusters AE01410.cl (60/63 ESTs from iL3) and AE03983.cl (2/2 ESTs from iL3) were both most closely related to a FAR protein from Ostertagia ostertagi , and more distantly to Ac-far-1 and -2. Therefore, as seen in other parasitic nematodes, most A. ceylanicum FAR proteins are related to C. elegans group A FAR proteins. However, the A. ceylanicum cluster AE00750 was most similar to group C FAR protein Ce-far-7. Group C proteins differ from the other FARs in important ways including lacking an N-terminal signal peptide (suggesting an intracellular location), containing several cysteines, and failing to bind DAUDA . AE00750.cl represents the first report of a FAR-7 like protein from a parasitic nematode. The function of FAR proteins is unknown but may represent a lipid acquisition system in which released FARs bind to lipids followed by uptake of the complex by a specific receptor mediated process. Retinoids are required for nematode growth and development, but are not synthesized by the worms. In parasitic nematodes, release of FAR proteins may also modify local inflammatory and immunological responses by delivering or sequestering biochemically important lipids . The application of genomic approaches to hookworms has resulted in more than a 100-fold increase in available sequence data from Ancylostoma species thereby allowing an initial bioinformatic analysis of transcripts from these important parasites and establishing a foundation for the eventual completion of a hookworm genome. Semi-automated informatic approaches that are now being applied to all nematode sequences  allow uniform comparisons across many genomes and provide databases for further exploration. Transcripts in A. caninum and A. ceylanicum include clear candidates for stage specific expression representing the very different biological processes underway in different points of the lifecycle. The availability of the C. elegans and C. briggsae genomes has allowed highly informative comparisons to the two hookworm species showing extensive overlap in gene complements, including genes demonstrated to be essential in C. elegans and numerous genes specific to nematodes. As the most closely related major human pathogen to C. elegans, hookworms provide an attractive near-term application for using a model organism to better understand and eventually control a key disease-causing species. Beyond categorization of hookworm genes, clear research avenues are available to apply this information to improved methods for hookworm control including anthelmintic and vaccine development, diagnostics, population studies, as well as better understanding of fundamental aspects of hookworm biology, such as host immune system modulation. A Shanghai strain of A. caninum was maintained in beagles as described . Infective L3 (iL3) were recovered from 7–10 day old coprocultures using a modified Baermann technique, washed clean of debris with BU buffer (50 mM Na2PO4/22 mM KH2PO4/70 mM NaCl, pH 6.8; ), and snap-frozen by immersion in liquid N2. Frozen larvae were stored at -80°C until used for library construction. Serum stimulated larvae (ssL3) were generated by incubating iL3s harvested from a North Carolina strain of A. caninum in 5% normal dog serum for 20–24 h at 37°C, 5% carbon dioxide. Tissue-arrested L3 larvae (taL3) were recovered from BALB/c mice infected with 1,000–1,500 iL3 (North Carolina strain) and euthanized at 10–14 days post-infection . A Warsaw strain of A. ceylanicum was maintained in Syrian hamsters as described , and L3 recovered, washed, and frozen as above. For the recovery of adult stage A. ceylanicum, infected hamsters with patent infections were sacrificed and the small intestine removed. The intestine was cut into 3 sections, opened longitudinally, and hung in 50 ml centrifuge tubes containing phosphate buffered saline at 37°C for 2–3 hrs. Following incubation, adult worms were recovered from the sediment, washed free of debris, and snap-frozen as above. All animals were housed and treated in accordance with institutional care and use committee guidelines. Pulverization for the ssL3 and taL3 was performed using an Alloy Tool Steel Set (Fisher Scientific International). Total RNA from adult and larval parasites was prepared using TRIzol Reagent (GibcoBRL, Life Technologies or Invitrogen, Carlsbad, CA). SMART based serum stimulated L3 library – Library construction was based on the SMART cDNA library construction system (Clontech Laboratories; ). mRNA was extracted from 10 μg of total RNA using a Dynabeads mRNA Purification kit (Dynal Biotech) with some modifications. First strand synthesis was performed with the mRNA bound to the oligo-dT of the Dynabeads using Superscript II RT (Invitrogen, Life Technologies) and the primer smart T7_3G_5. Concatemers were digested with Not I on the bead. Second strand synthesis was performed with the smartT7_5 and the smartCDSII primer. Amplification of the cDNA was performed with the smartT7_5 and smartT7_3 primers with cycling parameters of 95°C for 5 minutes, seven cycles of 95°C for 5 seconds, 60°C for 5 seconds and 68°C for 6 minutes followed by a 4 minute extension at 68°C. Following amplification, the cDNA was purified using the High Pure PCR Product Purification Kit (Roche). The final 5 cycles of PCR introduced the deoxy-UMP primers needed for cloning into the pAMP1 vector (Invitrogen, Life Technologies). cDNA fragments >1 kb were size selected on a 0.8% TAE agarose gel and cloned into the pAMP1 vector following the CloneAMP pAMP1 System (Invitrogen, Life Technologies). The ligation mix introduced into E. coli DH10B chemically competent cells (GibcoBRL, Life Technologies) resulted in 4.36 × 105 primary transformants. SL1-PCR-based tissue arrested L3 library – mRNA was extracted from 2 μg of total RNA using a Dynabeads mRNA Purification kit (Dynal Biotech) and eluted with 10 μl 10 mM Tris-HCl. First strand synthesis was performed using linker primer (GAGAGAGAGAGAGAGAGAGAACTAGTCTCGAGTTTTTTTTTTTTT) and Superscript II RT (Invitrogen, Life Technologies). Amplification with Taq Polymerase used the SL1 (GGGTTTAATTACCCAAGTTTGA) and Xhop (GAGAGAGAACTAGTCTCGA) primers and 5 μl of the first strand reaction. Cycling parameters were 95°C for 5 minutes, 30 cycles of 95°C for 1 minute, 47°C for 1 minute, 72°C for 3 minutes followed by 5 minutes at 72°C. cDNA fragments >1 kb were size selected on a 0.8% TAE agarose gel and cloned into the pCRII-TOPO vector following the TOPO TA protocol (Invitrogen). The ligation mix was introduced into E. coli DH10B chemically competent cells (GibcoBRL, Life Technologies). Hawdon infective L3 library – Frozen A. caninum L3 pellets were ground to powder on a mortar pre-chilled with liquid nitrogen. Total RNA was isolated from the powder using Trizol reagent (Invitrogen, Carlsbad, CA). Poly (A)+ RNA was isolated from total RNA using the Oligotex mRNA isolation kit (Qiagen, Chatsworth, CA). Approximately 5 μg of mRNA was used to construct a directional cDNA library in Lambda ZAP II (Stratagene, La Jolla, CA) as previously described . pBluescript phagemid were mass excised prior to sequencing. The library had >95% recombinants, and insert size varied from 700–3,000 bp. The library was amplified once (106 pfu). Hawdon adult and infective L3 A. ceylanicum libraries – Total RNA and poly (A)+ mRNA were isolated from the appropriate A. ceylanicum life-cycle stage using Trizol reagent and the Oligotex mRNA isolation kit as described above. Approximately 5 μg of mRNA was used to construct directional cDNA libraries in Lambda ZAP II (Stratagene, La Jolla, CA) as previously described . Both libraries had 99% recombinants with inserts ranging from 500–2500 bp (average 1500 bp), and each underwent one round of amplification (106 pfu). Inserts were mass excised as described above. SL1-PCR-based infective L3 and adult libraries – cDNA was PCR amplified, using SL1-EcoRI primer on the 5' end and oligo(dT)-XhoI on 3' end, gel fractionated , and non-directionally cloned into pCR-TOPO-XL (Invitrogen), following XL-Topo TA cloning protocol. The cDNA inserts were excised with EcoRI. Sequencing, EST processing and clustering were performed as described . Information for clone requests and sequence trace files are available at http://www.nematode.net. The completed cluster assemblies, NemaGene Ancylostoma caninum v 2.0 and A. ceylanicum v 2.0, were used as the basis for all subsequent analyses and are available for searching and acquisition by FTP at http://www.nematode.net. "Fragmentation", defined as the representation of a single gene by multiple non-overlapping clusters, was estimated by examining Ancylostoma clusters with homology to C. elegans . Overall representation of Ancylostoma genes is based on a theoretical gene number of 21,437, comparable to C. elegans wormpep97. Homology assignments – WU-BLAST sequence comparisons [63, 64] were performed using A. caninum and A. ceylanicum contig consensus sequences which were further organized into clusters. Consensus sequences were used to search multiple databases, including the non-redundant GenBank (3/20/2003) and Wormpep v.97 C. elegans (Wellcome Trust Sanger Institute, unpublished) protein databases. Internally constructed databases using intersections of data from Genbank, allowed examination of sequences in specific phylogenetic distributions. Homologies were reported for E (expect) value scores of ≥ 1e -05. To identify cases where Ancylostoma homologs in C. elegans have been surveyed for knock-down phenotypes using RNA interference, Wormpep BLAST matches were cross-referenced to a list of 17,042 C. elegans genes with available RNAi information (20th February 2005) http://www.wormbase.org. For each Ancylostoma cluster, only the best C. elegans match was considered. Functional classification – Clusters were assigned putative functional categorization using two methods. First, InterProScan v.3.1 ftp://ftp.ebi.ac.uk/pub/software/unix/iprscan was used to search contig translations versus InterPro domains (11/08/02) [65, 66]. Using InterPro, clusters were mapped to the three organizing principles of the Gene Ontology (GO_200211_assocdb.sql) . Mappings are stored by MySQL database, displayed using AmiGo (11/25/02) http://www.godatabase.org/cgi-bin/go.cgi, and are available at http://www.nematode.net. Second, clusters were assigned by enzyme commission number to metabolic pathways using the Kyoto Encyclopedia of Genes and Genomes (KEGG) database (2/24/2004). All matches better than 1e-10 were taken into consideration. Orthologs and dN/dS ratio – A. caninum / A. ceylanicum orthologs were determined by reciprocal best TBLASTX match using a threshold of E value ≥ 10-5. In addition, the ORFs accepted to be the correct translation were required to have the best C. elegans gene match in the same frame as the TBLASTX matches. Only continuous alignments longer than 30 amino acids were accepted. 'Suboptimal alignment program' (Jason Stajich, unpublished), scripted using tools in Bioperl  and utilizing 'yn00' from PAML , calculated the synonymous (dS) and non-synonymous substitutions (dN) per ortholog pair. A 4-way orthologs were assigned by using SSEARCH [71, 72] to find the best C. elegans and C. briggsae homolog for each ortholog pair of A. caninum and A. ceylanicum. Orthologs were assigned if both sequences agreed on the best hits. Multiple sequence alignments were performed with MUSCLE . Trees were built using the programs 'protml' and 'nucml' for protein and nucleotide sequences respectively . An exhaustive search was used first to enumerate the possible topologies and then -R rearrangement search was used to identify the most likely branch lengths and bootstrap values. Only genes for which well supported topologies where A. caninum and A. ceylanicum appeared as sisters were used in subsequent analysis. Tree branch lengths were parsed and processed with Perl scripts written using modules from the Bioperl package and statistical tests were applied with the R package . Makedonka Mitreva, James P McCarter contributed equally to this work. Ancylostoma EST sequencing at Washington University was supported by NIH-NIAID research grant AI 46593 to RHW. The authors would like to thank B. Chiapelli, C. Murphy, D. Pape, Bin Zhan, Adriana Magalska and E. Janecka for technical assistance, Reshad Dobardzic, Halina Wedrychowicz and Jerzy Behnke, for providing larval strains, and Peter Hotez and the Human Hookworm Initiative from the Sabin Vaccine Institute for their support. JPM was supported by a Helen Hay Whitney/Merck Fellowship. JES is supported by an NSF pre-doctoral fellowship. JPM is employee and equity holder of Divergence Inc; this research was not company funded. MM, JPM, SWC, RKW, and RHW conceived and designed the research plan and participated in all aspects of data collection and analysis. MM, JPM, MD, TW, JX, and JES analyzed and interpreted the data. PA, JH, and WK contributed material and constructed cDNA libraries. MM, JPM, PA, and JH drafted the manuscript. All authors read and approved the final manuscript.